COLONY is the latest deckbuilder from Bezier Games (Suburbia, Ultimate Werewolf). It combines the fixed-asset mechanics of games like Dominion (the cards you acquire each game don’t change) with the dice-rolling player interactivity of games like Machi Koro. In the game, players are leaders of different post-apocalyptic societies, competing over scarce resources like food, scrap metal, and uranium. Each turn, dice are rolled which signify these resources, then take turns selecting them for their warehouses. Afterwards, these dice are used to purchase different additional cards, allowing players to vie against one another for the most in-demand resources. Players begin with four cards, a supply exchange, a warehouse, and construction and upgrade depots, and use acquired resources to purchase additional cards throughout the game. In addition to adding extra game interaction, the purchasable cards also provide victory points- 16 points and you win! 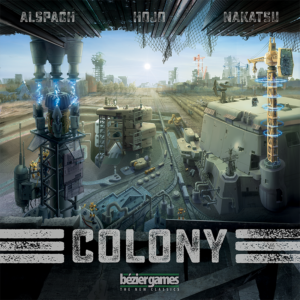 Overall, Colony has a lot going for it in terms of replay value, player interaction, and skill-focused play with just enough variance. However, it does fall a little short in terms of translating the theme of the game into the mechanics. There’s nothing in the mechanics of the game that differentiate the resources, beyond what is required to purchase other assets. However, the mechanics themselves succeed in delivering a comprehensive game that allows for a good amount of strategy, as well as plenty of opportunities to interfere with your opponents. It’s an excellent choice if you’re looking for a mid-range complexity deck builder that has a high level of player interaction, or if you just like the theme of post-apocalypse development. There is also an option for solo play. Best of all, this game is available in the Meeples Games Game Library!